*When the GrowingDeer Team is processing and grinding venison we mix up and package a few pounds of ground venison with Italian seasoning. We don’t form the meat into individual sausages. We simply add it to the ground venison for use in recipes calling for ground beef. It adds that special zing and Italian flavor. Divide each tube of dough into four pieces. On a floured surface press each piece into a circle. Add toppings to half the dough as desired. Fold dough over to cover toppings. Pinch edges together. Brush dough with beaten egg (for a golden crust!). Cook in 425 degree oven until done, about 20 minutes. 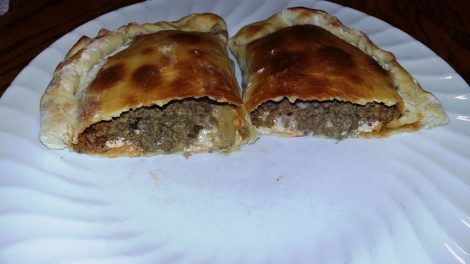 Calzones are easy to customize to your family’s tastes. Add whatever you like – olives, green pepper, bacon, jalapenos – the options are unlimited! Before you put toppings on, put the dough on either a silicone baking mat or on parchment paper. This way you can simply slide the entire mat onto a baking sheet. It makes clean up super quick too!